NZXT announces the Phantom 530, the successor to the original Phantom line. The case will ship soon in white, black and red for $119.99. Full specifications over here. In 2010, NZXT introduced the industry to its Phantom chassis, an aggressively designed, feature-rich case for mainstream users, gamers and enthusiasts alike. 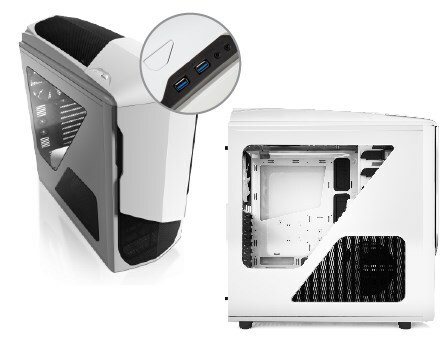 Now, NZXT is finally ready to unveil its direct successor, the Phantom 530. Along with its fully modular, interchangeable hard drive cages, the new Phantom features all of the latest NZXT technologies including: a discrete SSD mount behind motherboard tray, signature rear I/O LEDs, single channel 30W fan control with integrated 10-port fan hub and steel 5.25" optical drive latches. The Phantom 530's extensive liquid cooling support includes Kraken X40/X60 compatibility and radiators of up to 360mm in size on top, 240mm in front and 240mm on bottom. Additionally, the new Phantom also features the largest window the Phantom line has ever seen, letting you show off the true beauty of your masterpiece, inside and out.